Shirts With Random Triangles: Pat Fitzgerald now highest paid Northwestern University employee. 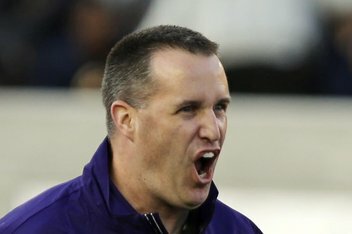 Pat Fitzgerald now highest paid Northwestern University employee. Pat Fitzgerald has become the highest paid employee of Northwestern University. According to a report by USA Today, the Wildcats' head football coach was credited with a compensation package worth at least $2.2 million dollars in 2011. This marks the first time since 2005 that a Northwestern coach has been the private university's highest paid employee. "Pat Fitzgerald was credited with more than $2.2 million in compensation during the 2011 calendar year, according to the university's new federal tax return. That is nearly $1 million more than he was reported as making in 2010, and the differential is almost entirely in base pay." USA Today based its report on Northwestern University's most recent federal tax return.